GARZON BEDOYA, G.; Redondo, J. M.; Rozanov, V.; Gushkov, S.
Experimental and numerical results on the advance of a mixing or non-mixing front occurring at a density interface due to gravitational acceleration are analyzed considering the fractal and spectral structure of the front. The experimental configuration consists on a unstable two layer system held by a removable plate in a box for the Rayleigh-Taylor fronts and a dropping box on rails and shock tube high Mach number impulse across a density interface air/SF6. The evolution of the turbulent mixing layer and its complex configuration is studied taking into account the dependence on the initial modes at the early stages and its spectral, self-similar information. Most models of the turbulent mixing evolution generated by hydrodynamics instabilities do not include any dependence on initial conditions, but in many relevant physical problems this dependence is very important, for instance, in Inertial Confinement Fussion target implosion. We discuss simple initial conditions with the aid of a numerical model developed at FIAN Lebedev which was compared with results of many simulations. 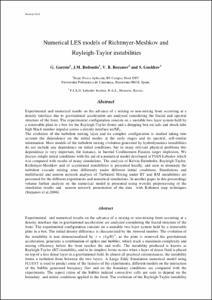 The analysis of Kelvin-Helmholtz, Rayleigh-Taylor, Richtmyer-Meshkov and of accelerated instabilities is presented locally, and seen to dominate the turbulent cascade mixing zone differently under different initial conditions. Simulations and multifractal and neuron network analysis of Turbulent Mixing under RT and RM instabilities are presented for the different experiments and numerical simulations. In another paper in this proceedings volume further analysis on the numerical model is presented using wavelet preprocessing of the simulation results and neuron network presentation of the data with Kohonen map techniques (Stepanov et al.2004). GARZON BEDOYA, G. [et al.]. Numerical LES models of Richtmyer-Meshkov and Rayleigh-Taylor instabilities. A: Summer School and Workshop on Environmental Turbulence. "SSWET". Madrid: Universidad Complutense de Madrid (UCM), 2010, p. 1-15.